Cameron “Cam” Sinclair is smart, driven, and dedicated, with an easygoing temperament that belies his strong will and the personal ambitions he holds close. Besides his family, his job as head of IT at the MacLaren Cattle Company and his position as a Search and Rescue volunteer are all he needs to make him happy. At least that’s what he thinks until he meets, and is instantly drawn to, fellow SAR volunteer, Lainey Devlin. Lainey is compassionate, independent, and ready to break away from her manipulative and controlling fiancé. Just as her decision is made, she’s called into a major search and rescue effort, where once again, her path crosses with the intriguing, and much too handsome, Cam Sinclair. But Lainey’s plans are set. An opportunity to buy a flourishing preschool in northern Arizona is her chance to make a fresh start, and nothing, not even her fierce attraction to Cam Sinclair, will impede her plans. 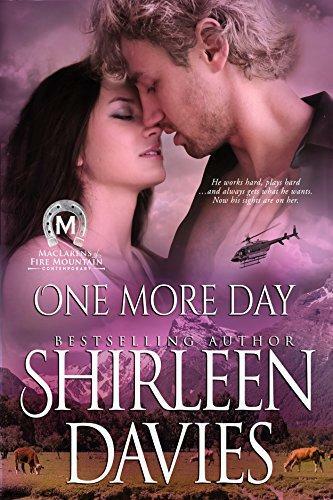 As Lainey begins to settle into her new life, an unexpected danger arises —threats from an unknown assailant—someone who doesn’t believe she belongs in Fire Mountain. The more Lainey begins to love her new home, the greater the danger becomes. Can she accept the help and protection Cam offers while ignoring her consuming desire for him? Even if Lainey accepts her attraction to Cam, will he ever be able to come to terms with his own driving ambition and allow himself to consider a different life than the one he’s always pictured? A life with the one woman who offers more than he’d ever hoped to find? One More Day is a full length novel with an HEA.